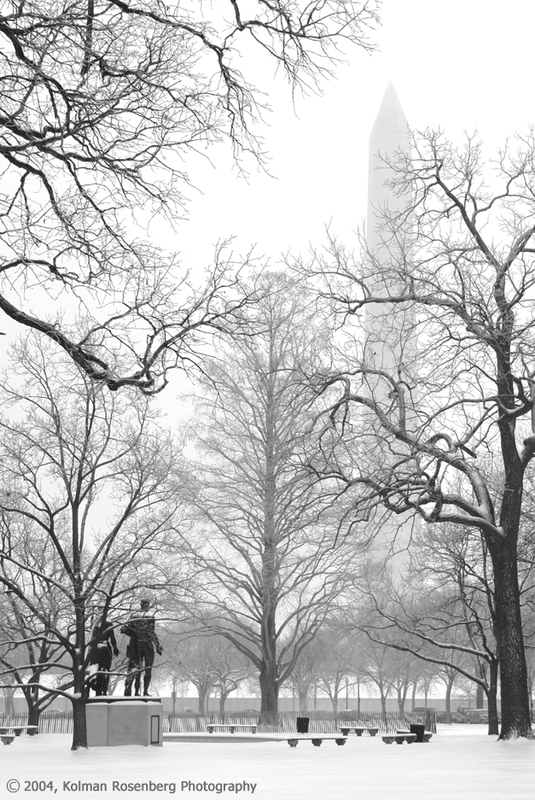 The Washington Monument seen through a snowstorm. Yesterday an earthquake struck near Washington, DC and was felt here in Northeast Ohio. Reports are that the Washington Monument suffered some cracking and will be closed for some indefinite length of time. That fact along with my last blog post prompted me to post this photo. I mentioned the cold weather and the snow on the Capitol building in the last post, photographed on a beautiful, crisp winter day. During that same trip to DC, on the previous day, in fact, I shot this photo. A much different looking day, blizzard-like, with just a faint snow obscured view of the Washington Monument in the background. It’s a pretty shot conveying a much different mood. Interestingly, many of my shots are converted to black and white from color images but this photo is in full color, with no conversion! That’s just the kind of day it was. Quite a contrast from the previous post which was one day later. This entry was posted in Uncategorized and tagged blizzard, DC, monument, snow, washington, winter. Bookmark the permalink.